The ixora's full, bushy growth and large inflorescence make it a popular garden choice, and it is relatively easy to care for. Ixora's most pressing need is the right location. It will only grow successfully in USDA hardiness zones 9 through 11, and only in areas where humidity levels are quite high. It will tolerate light shade in exceedingly hot climates, but prefers a full day of sun. 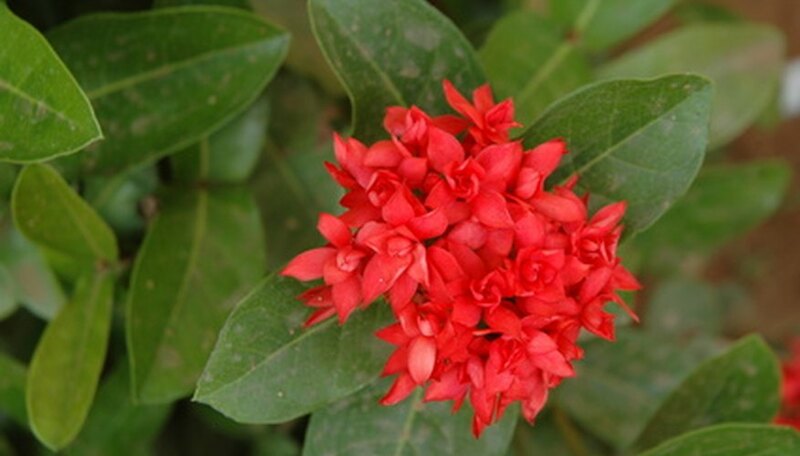 Once these requirements are met, ixora has consistent needs and can be treated much like any other tropical plant. Water your ixora shrub whenever the top 2 to 3 inches of the soil dry out. Check the soil's moisture level frequently by sticking your fingers or a wooden dowel into the soil. This is especially important during the hottest months, when the shrub may need watering as frequently as once daily. The best way to water your ixora shrub is to place a slow-running hose at its base until the soil is moist to the depth of the shrub's root ball. Fertilize your ixora shrub with a balanced commercial fertilizer once monthly. When the ixora is in bloom, switch to a "bloom burst" fertilizer to get the most out of the flowering period. Follow the manufacturer's instructions for application rates and amounts based on your ixora shrub's size. Spread the fertilizer around the ixora's roots (roughly 1.5 times the area of the foliar spread). Add 2 inches of water after you fertilize to help the fertilizer reach the shrub's roots. Prune your ixora shrub in early spring just as it begins to produce new growth. Shape it by simply cutting back any overgrown branches to the desired height. But take care--the ixora's buds are at the ends of its branches. Do not prune too much, or you will significantly reduce the number of flowers you have this season. Contact your local county extension office and arrange a soil test to be conducted once every two years. Ixora needs highly nutritious soil with a pH of around 5. The results will recommend any soil amendments required to meet your ixora's pH needs. Ixora planted in alkaline soil (with a pH higher than 7) should be moved to neutral or slightly acidic soil.